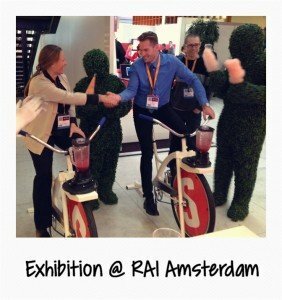 Ketchum’s client was exhibiting at the RAI in Amsterdam at a 3 day event and needed a showpiece activity to engage with their current customers and potential clients. We provided branded bikes and smoothies to complement their stand design, and worked with the client to develop an interesting giveaway offer to guests who played smoothie bike arcade and beat their rival. All equipment was delivered from the UK and we provided on site staff for set up and the event itself. 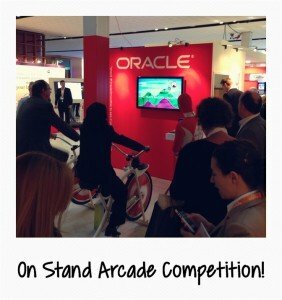 "We liked the smoothie bike arcade challenge very much, it really gave the event a boost! All responses from the customers of our client were very positive. Also working with Love Smoothie Bike has been a great pleasure, with their enthusiasm and positive attitude they made everyone smile." Oliver Marketing’s client KPMG were communicating 5 key strategic growth initiatives to their offices UK wide, and wanted a bright, fun way of demonstrating them. Love Smoothie Bike provided 5 delicious smoothie recipes to match the SGIs and 2 ways of sampling them, through a sampling bar using commercial blending equipment, and a competitive blending challenge with 2 of our bikes and our smoothie bike arcade blending game! The roadshow visited 10 locations from London to Glasgow over 10 working days, we moved all of our equipment, and some of the clients as well and provided 2 members of staff at each location. 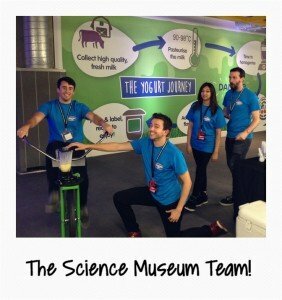 Danone approached us initially through an event agency for a large public event at the Science Museum in London. This was a late night free public event held once a month and Danone UK had been invited to provide an activity. 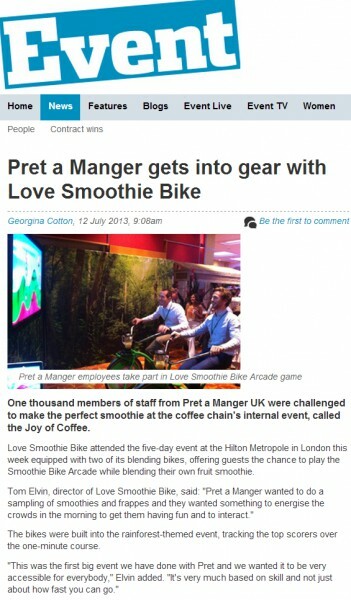 They were looking for an interactive tool to engage the public with one of their core products activia natural yoghurt and after talking with us found that we could incorporate the yoghurt into one of our delicious smoothies and have the public blend them on our bikes. We provided 10 bikes, supplementary ingredients and a fantastic team of 6. The event was more successful than we could have imagined, queues of hundreds of people waiting to pedal blend and enjoy a creamy yoghurt smoothie! 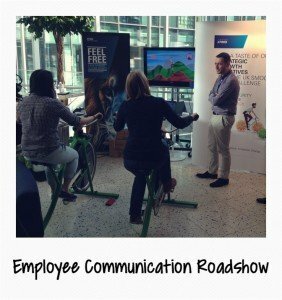 Finally at the start of 2015 we took our bikes to an on campus university roadshow with Danone UK to again pedal blend free yoghurt smoothies and speak to students about the company and brand. A week long event at the Hilton Metropole London, educating the delegates on all aspects of Pret’s fantastic coffee offer. The client was looking for an interesting way to engage and energise each half day session of 200 people. We built a rainforest themed area with a large shack style smoothie bar, and the centrepiece was 2 of our bikes in front of a giant plasma screen loaded up with our arcade blending game! 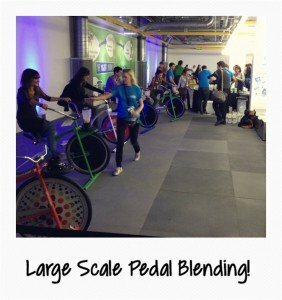 Nearly 2000 delegates enjoyed our smoothies and played or encouraged colleagues on our bike blending game and went on to have a great conference. The activity was received really well and featured in an Event Magazine article, which you can read on the right. Through event agency Envy Create we worked on two large scale launch events at Vodafone HQ, and a launch roadshow around the UK. At both events at Vodafone HQ we provided an all day fresh smoothie bar producing 1000 bespoke smoothies in batches of brand colours at pre determined times to suit the event. In addition to this 4 bikes and 2 arcade game set ups were also in place at HQ for the first of the events to really add something different and create some energy and buzz. 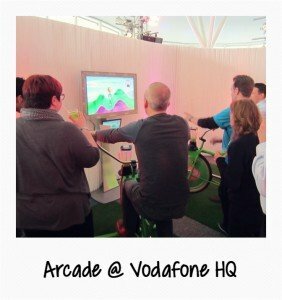 While for the UK launch roadshow later in the year single bikes were used without the game as a stand alone activity to engage guests in any location with no electricity required.